Hey guys, just got back from camp yesterday, was completely fatigued. 1st day 10/12/12, register at 1 pm. Opening ceremony at 2.30 pm (half an hour late), continue with praise and worship and ice breaker. We have 6 groups. I'm in group Blue. and guess what, our leader is a 15 year old girl. So, we need to discuss out group name, group's shout out, and the movie which we are going to film. Oh, did I mention Movie? The movie is for the 金钟奖, that's one of the reason I join this camp. Out of curiosity. Every group needs to film a movie within 3 days, and then, during 金钟奖 ceremony, the short movie will be judged, best actor, actress etc will be chosen. C is sitting next to me, the one with glasses. Blue is my group. But 3 of them are 导师，hence, not included in our group. So we were discussing the roles, I volunteered to be the camera man, coz I had my camera with me. And, I didn't felt appropriate to be the director coz I'm a new comer, and C is the leader. She asked the group for idea. She rejected me in a very pleasant and polite way(coz we just met). Then, she came out with her own idea, which has no ending, and not complete like mine. Later, our group start filming without a proper story, we only have the front part. We're an unlucky group to have an uncooperative guy. He's the only guy in the group. That's why we choose him to be the lead actor. Let's name him J. C got very mad and choose another girl to be the lead actor. C told me she wanted this, she wanted that. So I followed her instructions. But, she didn't quite like it. And asked me to re film (a few times). Getting a lil frustrated, I told her, I'll let her do the filming. But she insisted on me to do it. She was so bossy, she wanted everything to be perfect. I really wanted to tell her that we don't have a high tech camera and equipment nor that a group of professional actors. How to be perfect? But I didn't, since she's the leader, I'll just let her boss around. We ended up filming the 1st simple scene for like 10+ times. Which was very tiring for me and the actors. The next day, she had to prepare games for the afternoon telematch, so she told us this. So I created a situation with 对白 for the characters, we got that scene filmed after a few attempts and practices. And guess what, she didn't like it. This time, she rejected me in a rude way. I was so furious that time. But I remain silent. Then, she told us a scene and asked us to film according to her story line. Our group left 5 people, so another boy was added. Both J and W were very uncooperative. They didn't want to film, they didn't want to play water games, they didn't want to wash the plates. Every time during devotion, when they were asked to share something, they just remain silent. They just wouldn't want to think, when they were asked by our leader's leader, they just reply donno. After the telematch, I was so tired and headache that I left the last game(which only require 1 person to play), took a quick bath and went to sleep. My biological was messed up again. Hence, the night before, I couldn't sleep at all! I think that C got furious when she saw me sleeping instead of filming. Coz before that, she warned us not to rest after the telematch but continue filming without her. After 1 hour + of sleeping, I woke up and got better. I asked for panadols. Then I join the team with the filming. She was not there, another team's leader (which was also 15 years old) directed us. S said C was very angry with us. C said we were not cooperative wah. That's why S came and help us out. Please lah, if I'm not cooperative, I wouldn't have lend you my camera, I wouldn't have given you so many rejected ideas, I would have stop filming for your group. The reason she said we are not cooperative is because we couldn't film what she wanted. Plus there are 2 very uncooperative guy in our group who are not willing to do anything. Later, she came and join us. She didn't want to look at me and talked to us in a rude way. I think she discovered that I took panadols, her tone suddenly change and told me to rest. Better, I don't have to take orders from her. Honestly, I don't like to be ordered to do things. Especially from a 15 year old girl who became so bossy and arrogant. So I took another 1 hour nap until dinner. After praise and worship, we continue to film. Oh, I really got bored with this filming. The whole camp was all about filming. Last time, the whole camp was all about cooking, coz we need to cook every meal. And each meal took us about 3 hours. All the time just wasted like that. Now all the time wasted on filming and listening to bossy leader. So, this time, I let C to film it herself. 10.30pm, we all gathered at the hall for group devotion until 11pm. The 1st devotion still ok, and I did praised her for that. Coz I was kinda amazed that a 15 year old girl can lead us in devotion. But after the 2nd and 3rd one, Oh no....*face palm*, she herself didn't understand the devotion text. And she always pull that long face, I don't like to see that. This is so far the biggest mistake done by the committee of the camp, they chose a too young leader to lead us. Luckily, on the 3rd devotion is the youth leader himself lead us. Or else, we'll be in a MCC state. 11pm +, C started to edit the movie, she asked me to film the rest and insisted to finish it by that night. So, Me, bringing 2 other team members, continue to film the movie. Again, I created a scene and discussed the 对白with them. There's a girl from other team member came to see and help us. She asked us not to blame our leader wah, coz she is very stressful wah. I don't think it's the stress problem, the main problem is, she didn't communicate well with her team member. She only knows how to order people to do things according to HER way. And won't listen to her group member's suggestions and opinion. 1 team member scared C will not like the scene I created again, and said ask her suggestion first. I told her that C will not get satisfied everything we do, we can't do it her way. And I don't think she will reject what we film, coz this is our last chance to film. And there's a lot more editing for her to do. So 12pm +, finally, we got it done! 2 MCs of the day. All the group's movie was shown. When I saw our movie, I was fiendishly disappointed! She muted mostly the scene we film and put background music. 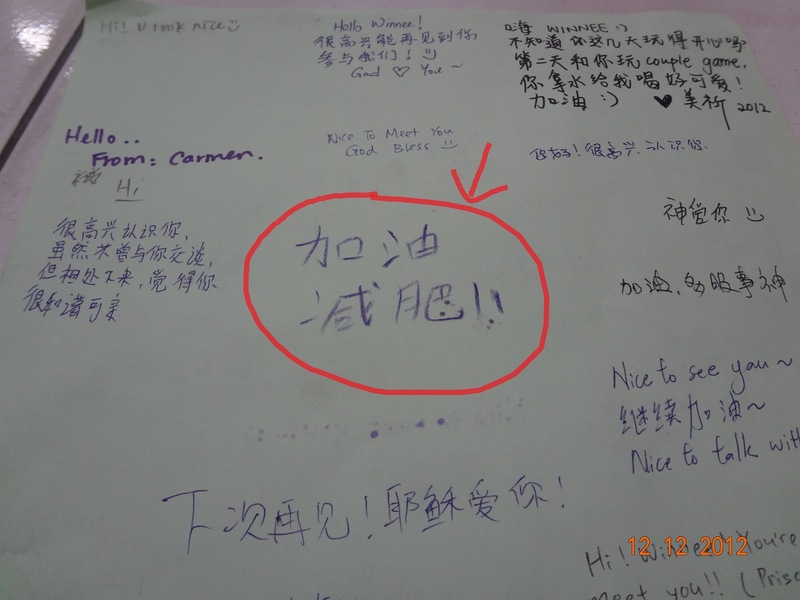 All our efforts of discussing, practicing the 对白 was wasted like that. If you don't want to have any 对白，just tell us lah. Then we no need to think of the conversation and practice, which was very time consuming. This whole filming thing is such a failure and disappointing. All the other groups won more than 1 awards. But then, thank God that our group at least won one award. All her hard work had paid off. And she thanked me for accompanying her to practice and film until midnight. I wrote everything I need to write on my leader's 留言板, and that 2 uncooperative guys. 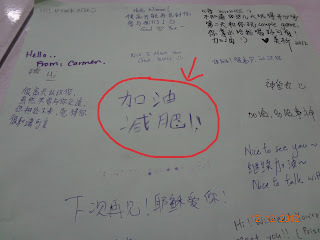 Someone actually wrote this on my 留言板。So brave and funny XD. I would rate the camp as 5/10. The speaker was good, the activities were quite fun. all the boys complain not enough to eat, at least should have fried mee hun or fried mee. They forgot to mention the rules and regulations of the camp until 2nd day. Their youth are not friendly. They just hang around together with their people and left the newcomers alone. Their time management was really bad. Every activities was late. The 金钟奖颁奖典礼did not went well, they have a lot of technical problem, so much time wasted. Their 2 MC not really good, especially my leader. Yes, she is one of the MC. The 分享午会also very time consuming. We should go back at 4pm. But they haven't end until 5.30pm, I requested to go home first coz I had caroling after that. They really need to improve on their time management. Last time I joined also like that. All in all, it was a brand new experience for me. Especially this filming thingy. Now I know what is meant by their 金钟奖. Next time if I see this thing in their activities list and still hold it at the same place, I won't join anymore.